First, we thought Europe may be too expensive to travel as early retired grey nomads. We were very surprised though, to find ways to travel Europe on a budget which you find in our Europe travel blog section. We added Europe travel tips and all the information to put together your personal Europe trip planner itinerary. There are so many great places to visit in Europe! Only two issues we struggled with: the summer and the Schengen Visa are too short! Luckily we eventually managed to get a long-term visa in France for George with his South African passport :D Read here how you can stay longer in Europe than three months! Austria took us by surprise. So clean and beautiful, all these quaint villages with flowers on their window sills and on every street corner. Traditional folks feasts with music and delicious food in mountainous surroundings. National parks with hiking trails all over the place, rivers, waterfalls – put Austria on your Europe trip planner itinerary, it’s a magical place. Since August 2017 we have our home base in Burgundy France. Our Europe travel tips will include more and more itineraries in and around France. Recently we bought a camper which allows us even more to discover this diverse and beautiful country. Read about the medieval town of Cluny which is situated about half an hour drive from us to the west in Burgundies wine region. Join THE WILD LIFE and get Travel Advice and Specials straight to your Inbox! So much to explore! Our Europe Trip Tips for Germany started with the romantic road trip which we can recommend to everyone who wants to experience the German culture and see some stunning architecture and castles. No worries, despite being small you won’t miss this tiny, well-forested gem in the middle of Europe. Driving through Europe it is likely that you’ll pass through Luxembourg. We encourage you to take the time and a closer look. Add the national park of Upper Sur National Park into your Europe trip planner itinerary, you won’t regret it. My parents are from the Netherlands which make me feel at home in this free and happy country. Some of George’s ancestors are from the Netherlands, too. They immigrated to South Africa some centuries ago. In our Europe Travel Blog section, you’ll find plenty of articles about the Netherlands as we frequently return to enjoy the Dutch way of life. Our favorite city is, of course, Amsterdam. Read about our favorite places in Amsterdam here. Norway is a country of extraordinary beauty. Its rugged coastlines with fjords, magnificent train journeys, and boat tours make for unforgettable travels. Norway is one of luxury senior trip destinations on cruise ships. We did it successfully on a budget – read more in our Europe travel blog section about Norway. Spain is probably one of the most frequented countries of all favorite senior trip destinations in Europe. It lends itself perfectly to early retired travelers and expat retirees as its mild Mediterranean climate provides a pleasant escape from the winter in the north of Europe. We did some house sitting in Spain’s southern Andalucia which boasts of wonderful Moorish architecture and great beaches. 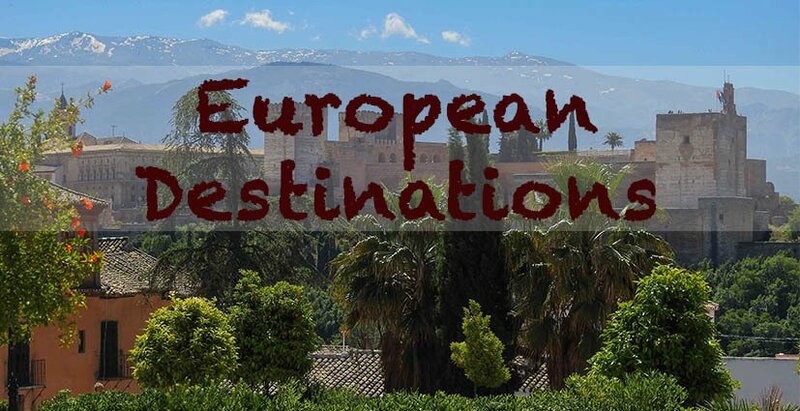 With our camper, we plan to explore more of the country and taste more of its extraordinary dishes which experiences we will add to our Europe trip tips for Spain. I grew up in Switzerland and my children still live in this fairytale country. As a citizen, I didn’t get to travel as much as I do now. With both, the eye as a Swiss and a traveler, our Europe Trip Blog to Switzerland will give you the insider information you need to make the most of your itinerary. Read here my insider guide about how to visit Zurich on a budget. With great pleasure, we traveled to the United Kingdom more than six months and visited most of the UK National Parks. If you search for true nature and house sitting experiences you will find here the best Europe trip planner to the United Kingdom with tips on how to visit London on a budget and a road trip to the best UK National Parks. Who Says There Are No Beautiful Beaches In Scotland?! Just A Handful Of Dog But A Feisty One! My Euro Trip Doesn’t End Here And Yours? So much to see and discover in Europe! We’ve been in many places but the whole of Eastern Europe we haven’t covered yet. George’s and my Euro trip doesn’t end here and we’ll blog of further countries as we travel along. How about you? What is your next destination in Europe? Would you like to know more about how we retired early and afford to travel the world at a slow pace? Here you go! Check out also Museuly’s 25 less touristy European countries! If you’d like to know more about our travels to other continents click here for more information.